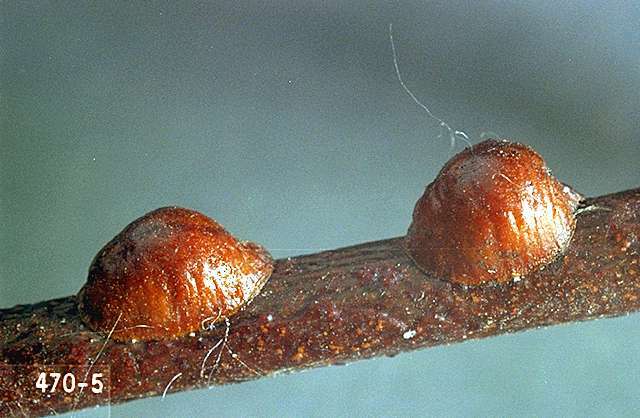 Pest description and crop damage Lecanium scales overwinter on twigs and branches under a hard, helmet-like, reddish-brown covering, which is about 6-8 mm in diameter. 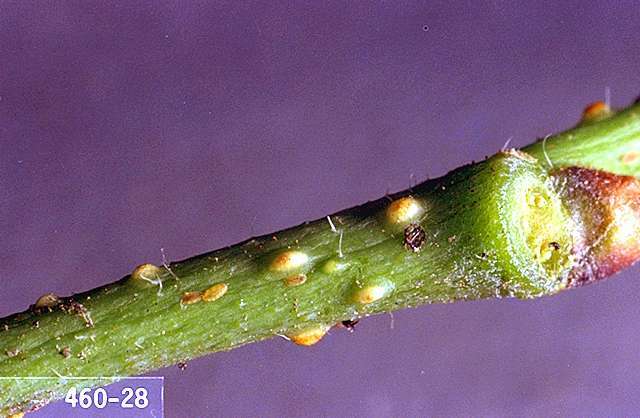 Azalea bark scales overwinter on older twigs and branches, under a white, felt-like egg sac about 6-12 mm in diameter. 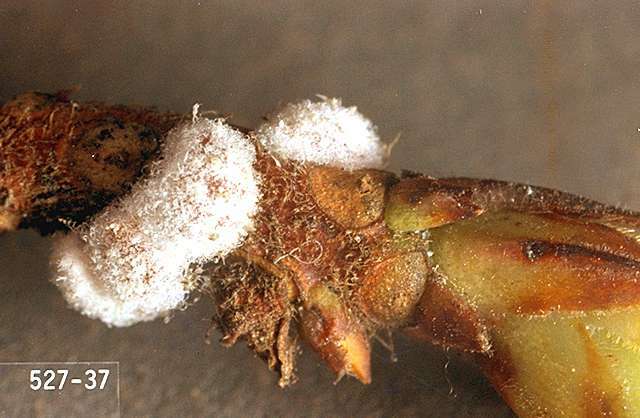 In the spring, the eggs under the winter covering hatch and young nymphs (crawlers) actively move about the plant and begin feeding on leaves and stems. Azalea bark scale nymphs are distinguished by their red color. Nymph feeding of both species can reduce photosynthetic capability of the plant and cause weak growth and, possibly, a reduced crop the following year. 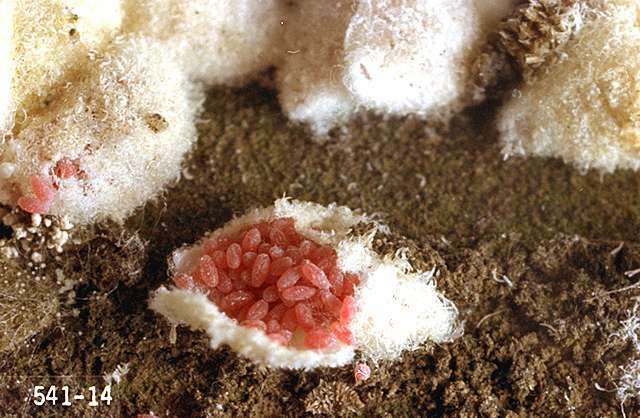 A more direct damaging affect is the sooty mold (a black fungus) that grows on the honeydew secreted by the scale, rendering fruit unmarketable or of a lower value. Control requires thorough coverage with a drenching spray. Scouting and thresholds Inspect twigs during the dormant season for scale. Pay particular attention to weak plants. The crawlers are best observed during May-July with a 10X magnifying glass. In spring, when weather warms up, placing a sticky substance, such as double-stick tape, Tanglefoot, or a similar adhesive, around a branch above and below infestations of adult scale can easily "catch" crawlers as they migrate from their winter enclosures and indicate when crawlers are on the move and a good time to target control. Larvae of green lacewings are aggressive predators of scale. Avoid excessive nitrogen fertilizer, as this favors increases in scale populations. Home gardeners: scale can be rubbed off plants by hand with a glove or toothbrush. Major infestations can be pruned off. Chemical controls are timed to achieve control of either the overwintering scale or the crawlers. dormant oil (98%)-Apply oil sprays while plants are dormant and when temperatures are above freezing. Some formulations are OMRI-listed for organic use. bifenthrin (Brigade and other brands) at 0.033 to 0.1 lb ai/a. PHI 1 day. Make a cover spray application when crawlers first emerge. horticultural oil (several brands)-Consult label for rate. Apply oil while plants are dormant and when temperatures are above freezing. Some formulations are OMRI-listed for organic use. insecticidal soap (M-Pede and other brands)-Consult label for rate and use directions. PHI 0 days. Apply when crawlers first emerge. Some formulations are OMRI-listed for organic use. malathion (several brands) at 1.25 lb ai/a. PHI 1 day. Apply when crawlers appear, as a spray in 100 gal water/a. After June, use 150 to 200 gal water/a. pyriproxyfen (Esteem) at 0.9 lb ai/a. PHI 7 days. Apply either at dormant or delayed-dormant for the overwintering stage, or as an in-season cover spray for control of the crawlers. At dormant or delayed-dormant, use with a horticultural oil. Make cover spray applications when scale crawlers first emerge.